The What: Crestron is now shipping new modular utility amplifiers. 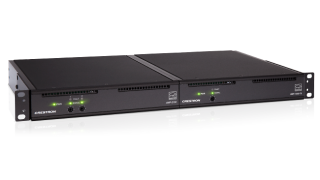 The new AMP-1200 and AMP-2100 are designed for easy installation, with no rack shelves, power connector terminations, or external power supplies required. The What Else: Installing the new Crestron modular amps is designed to be fast and easy. All of the hardwre needed comes in the box. Integrators do not need to research, order, or keep track of separate rack ears, shelves, spacer kits, or any other extra installation hardware. The slide-lock design provides secure, professional 1U mounting without a shelf for single-amp and gang configurations. Thanks to the internal power supply with IEC connector, there is no need for unsecure external power supplies or terminating power cables in the field. Crestron modular amplifiers amps are also Energy Star certified: they power down when not in use and feature “fast on” power up to avoid clipping of program audio. The Bottom Line: AMP-1200 and AMP-2100 are part of Crestron’s complete new line of single- and two-channel modular amps. Additional models will be available soon.